SEO means "search engine optimization". SEO is the process of getting traffic from the "organic", "editorial" or "natural" search results on search engines such as Google, Bing and Yahoo. SEO branding can help build recognition and trust for companies planning a stock listing on the BSE,NYSE or NASDAQ. . Approximately 93% of online experience start with search engine. 70% of clicked search results are organic. 89% of marketers say SEO is successful. SEO is much cheaper and involves more of a time investment than a financial one. The result last for some time, even if you stop optimizing your page. SEO is a long lasting marketing strategy. the efforts you make today will pay off for months or year to come, in terms of ranking and visibility. SEO starts off slowly initially, but over time it grows tremendously.SEO far more sustainable than PPC, potentially resulting high quality. Prepare indexable content and crawlable link structure. Implementing Black Hat SEO tactics and strategies can get your site banned from search engines. We design the campaign based on targeted consumer's buying behavior and the right SEO keywords. Without goals there can be no strategy and without strategy you are not optimizing. Customizes alerts and automated rules to manage and monitor the performance of your campaigns effectively. 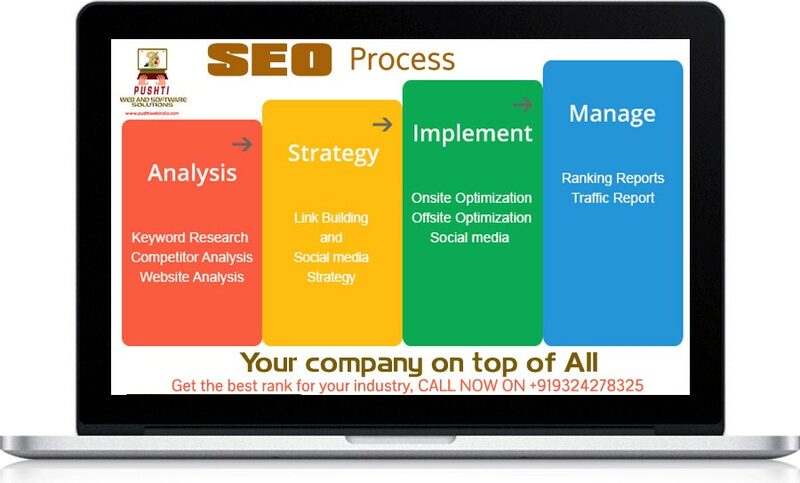 Search Engine Optimization SEO Plans – Minimum 6 MONTH Costing. Please Note: Above plan rates are effective only within 15 days period. 100 % Payment in advance. - 30% High Competitive Key-phrases. - 40% Medium Competitive Key-phrases. - 30% Low Competitive Key-phrases. -Minimum 3 Keywords per Product / Service / Location. -Press Release Writing will cost extra. -Minimum Period required will be for 6 months. Within the first week, our CTO provides you with a technical site review and keyword phrase strategy. Within the first thirty (30) days, we begin optimizing and submitting to all engines and directories. Within the first sixty (60) days, the search engine and directories begin to show results of our preliminary efforts. What is your Holistic SEO Approach? We optimize existing site pages as opposed to creating doorway pages (unless site pages are in Flash, .ASP etc). This means that there is extensive coding work involved - accordingly a date-wise activity plan is communicated to you/client. As with any project, deviations from the comeback dates (client approvals) will introduce delays into project task completion dates. Yes. We are a member to major SEO related directories/chapters and subscribe to the industry SEO code of ethics. We also are member to W3C. We have successfully positioned ourselves as the 'what SEO services really ought to cost' company in last 20 years of Experience and Skill. We promote our SEO services on the 'knowledge at a low price' platform - in other words, we offer value. We are a true blue, knowledge-centric and process-focused SEO Company, albeit able to offer world-class SEO services at offshore rates.